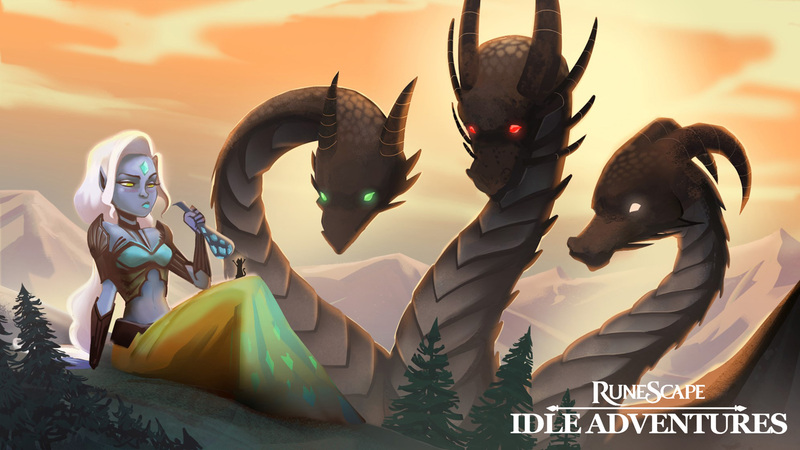 We're proud to announce an all-new, free-to-play game – RuneScape: Idle Adventures – coming this year to PC, iOS and Android! What is RuneScape: Idle Adventures? RuneScape: Idle Adventures is a new game being made in collaboration with our good friends over at Hyper Hippo – the mad geniuses responsible for the wildly popular AdVenture Capitalist. They're massive fans of RuneScape, and have been working closely with us on a fresh, accessible take on the emerging idle game genre. It's an addictive, quick-to-play RPG boiled down to the basics of levelling and looting. In a typical session, you'll spend a few minutes making choices for your customisable hero, then leave him or her to train, fight and quest in real time. Chilled-out, low-intensity gameplay sits alongside deep character progression and a light-hearted, comedic story, with nuggets of RuneScape lore unveiled as you progress. You can check in anywhere, any time, on PC, tablet or your mobile phone – taking the adventure wherever you go. It's also a perfect second-screen game while you're training your skills in RuneScape! In RuneScape: Idle Adventures, you're the wielder of an Elder Artefact known as the Needle. It's your job to nurture and protect Gielinor, doing whatever it takes – from fishing trout to grappling with the gods – to help those who call it home. While Idle Adventures' story is separate from the World Guardian's, you may recognise familiar locations and situations – all wrapped up in a breezy narrative style. What Does This Mean for RuneScape? Hyper Hippo are the best at what they do, and they're heading up development of Idle Adventures. We're involved with creative direction and game design – making sure that the new game is a good fit for Gielinor. Other than that, it's down to them. RuneScape and Idle Adventures are separate games – there's no need to play one to enjoy the other – but we hope you'll find that they're both great ways to get your adventuring fix. Sounds Cool! When Can I Play It? RuneScape: Idle Adventures will be available to play on PC from spring – as a free download on Steam. iOS and Android versions will follow later in the year. We hope you're as excited about it as we are. Look out for more information coming soon, including a live stream on our Twitch channel - coming 19th February. The Bird of Hermes is my name, eating my own wings to keep to me tame. I can see the thread getting salty already.. However IMO, it's always smart to widen your gaming horizons. LOL did this, WoW did, they all have. Never know what the future holds and it's wise to have multiple outlets. I'm on YouTube - Search me at Littlejayberry. Or don't. Up to you. Could be fun tbh, especially seeing as the main game wont be influenced in terms of less dev time and such . PS: Mod Mark update your avatar profile mayne! It looks sad. I'm on YouTube - Search me at Littlejayberry. Or don't. Up to you. Definitely going to have to give it a try, looking forward to hearing more about it! I'm a big player of AdVenture Capitalist, can't believe that there's a RuneScape one coming out! Excite! I'm an apostrophe, I'm just a symbol to remind you that there's more to see.